An aerial view of the realigned stream and new bridge. The banks of this realigned segment were armored with rock riffle to prevent future erosion. A custom aluminum railing and bridge monuments provide the finishing touch on this new bridge over a realigned segment of Sugar Creek. Stream mitigation of Jordan Creek accounts for unavoidable impacts to Sugar Creek while enhancing the natural beauty of Brookview Park. 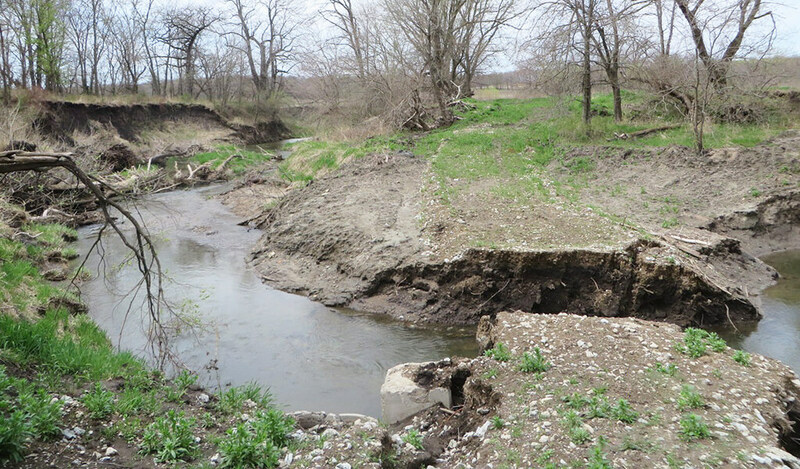 Severe stream bank erosion was observed at the project site prior to construction. 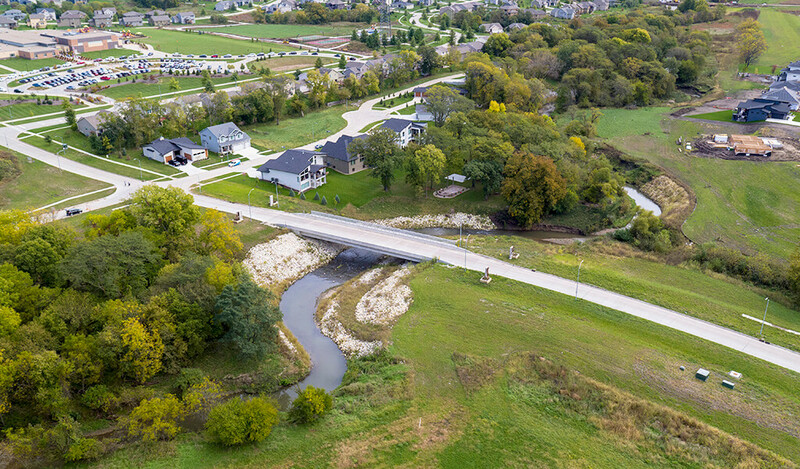 The Stagecoach Drive Extension over Sugar Creek is a project in West Des Moines that extended a minor arterial roadway to serve a rapidly-growing residential area. Stagecoach Drive is currently a two-lane road, which is planned for expansion to five-lanes as future conditions warrant. Ultimately, city traffic models predict that Stagecoach Drive will carry up to 23,000 vehicles per day, creating a need for additional lanes. 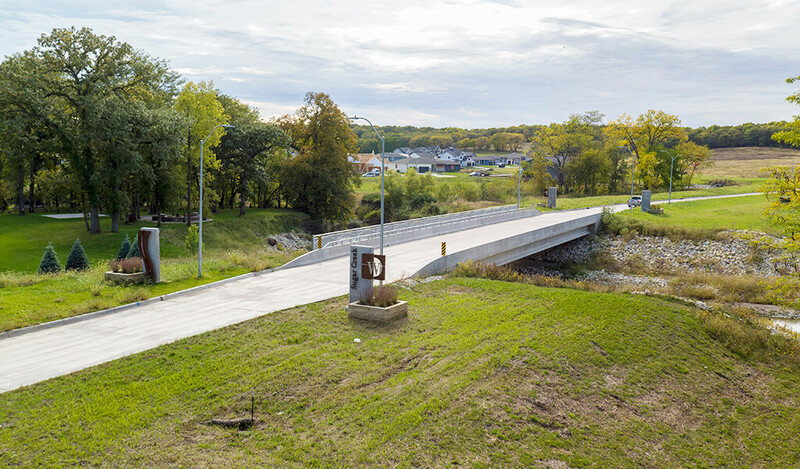 As land development in West Des Moines pushes to the west side of Sugar Creek, a bridge crossing on Stagecoach Drive was included in the City’s comprehensive plan. With Stagecoach Drive already constructed 500-feet to the east side of Sugar Creek, options to cross the creek were limited. The crossing location was at a sharp meander in the creek with highly eroding banks. After completing an alternatives analysis and coordinating with the U.S. Army Corp of Engineers (USACE), we determined the best solution was a single span 135-feet-long, 30-foot-wide, Pretensioned Prestressed Concrete Beam bridge with a five-foot-wide sidewalk on the south side. As future traffic demand warrant, the bridge can be widened to provide 660-feet of roadway with a 10-foot-wide trail on the north side. The sharp meander in the creek needed to be removed to accommodate the new bridge. By realigning the creek to minimize the meander, the stream length of Sugar Creek was reduced by 140 feet. At the time of project design, stream mitigation banks offering credits within the watershed were not available, so Snyder & Associates Environmental Scientists reviewed city-owned property that would be suitable for mitigation for the stream realignment. 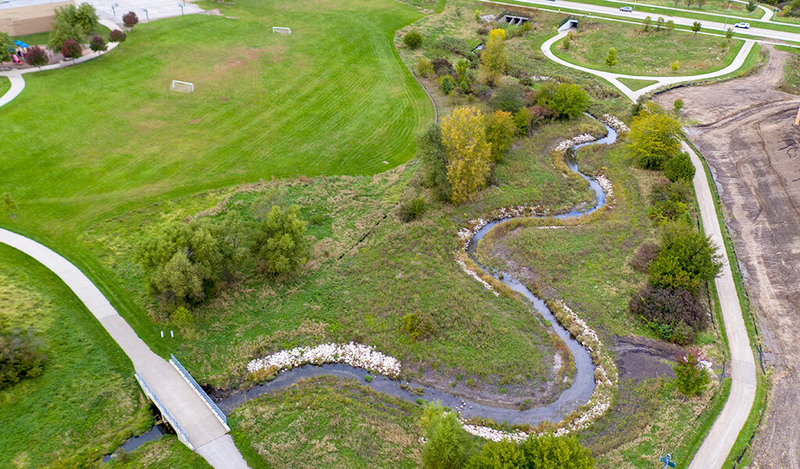 Jordan Creek, which runs through Brookview Park in West Des Moines, was chosen to mitigate the environmental impacts of Sugar Creek stream realignment. Eroding streambanks, minimal trees, and plenty of area to increase the stream length made Brookview Park an ideal mitigation location. The improved stream enhances the natural beauty of the park. Coincidentally, the stream realignment design increased the overall length of Jordan Creek by nearly 200 feet. Back at the site of the roadway expansion, the banks of Sugar Creek were armored to prevent erosion around the bridge abutments and a rock riffle was installed downstream to reduce overall erosion. The bridge accommodates the planned construction of a trail along the west side of Sugar Creek, which will go underneath the bridge. Water flowing through the project site now appears clearer than water upstream and downstream, signaling that erosion control measures in the area are working. The City of West Des Moines wanted the creek crossing to be aesthetically pleasing and harmonize with other creek and river crossings in the area. With that in mind, we developed a custom aluminum railing design for the Stagecoach Drive bridge and other local bridges, including the new Grand Prairie Parkway bridges over Sugar Creek and the Raccoon River. Custom bridge monuments were also designed and constructed for each corner of the new bridge, creating a sense of place. Monuments on the north side of the bridge are within the future widened roadway’s footprint, so our structural engineers designed them to be capable of moving in the future. Monuments will also be built at other local bridge locations to tie the bridge crossings together and help the traveling public feel connected to the environment around them. The monument on the right side of the bridge approach contains the West Des Moines logo and the name of the waterway that’s being crossed. The bridge, monuments, and stream mitigation at Brookview Park were constructed during the 2017 construction season. As the lead consultant, our responsibilities included the design, permitting, and construction oversight for the project. In addition to overall project management, the range of services provided included topographic survey, wetland delineation, hydrologic and hydraulic modeling, 404 permitting, roadway design, acquisition plats, and construction administration and observation. In addition, Shuck-Britson, our subsidiary, provided structural bridge design services.